The two-component model is a human movement model in which an aimed movement is broken into a voluntary ballistic movement followed by a corrective movement. Recently, experimental evidence has shown that 3D aimed movements in virtual environments can be modeled using the two-component model. 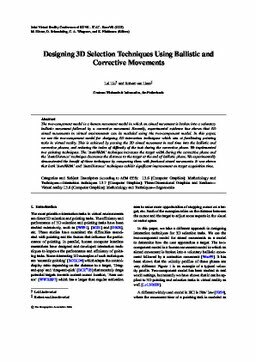 In this paper, we use the two-component model for designing 3D interaction techniques which aim at facilitating pointing tasks in virtual reality. This is achieved by parsing the 3D aimed movement in real time into the ballistic and corrective phases, and reducing the index of difficulty of the task during the corrective phase. We implemented two pointing techniques. The ‘AutoWidth’ technique increases the target width during the corrective phase and the ‘AutoDistance’ technique decreases the distance to the target at the end of ballistic phase. We experimentally demonstrated the benefit of these techniques by comparing them with freehand aimed movements. It was shown that both ‘AutoWidth’ and ‘AutoDistance’ techniques exhibit significant improvement on target acquisition time. Liu, L, & van Liere, R. (2009). Designing 3D Selection Techniques Using Ballistic and Corrective Movements. In Proceedings of Joint Virtual Reality Conference of EuroVR - EGVE - VEC 2009 (pp. 1–8). Joint Virtual Reality Conference of EuroVR - EGVE - VEC (JVRC).